Attach optional lighting gear or handles to a Steady Tray Mount for GoPro using this 1" Ball Mount from Ikelite. 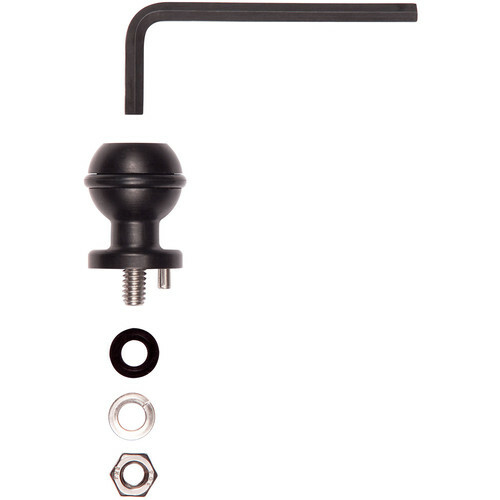 This item connects to optional ball arms from Ikelite, TLC, Ultralight, Nauticam, and others via an optional ball clamp. Constructed of Type III (hardcoat) anodized aluminum, this 1" ball features a groove and O-ring to prevent slippage, offering the ball clamp more friction to improve its holding power. Box Dimensions (LxWxH) 2.1 x 1.6 x 1.0"
Does this screw into the top of the red, quick release grip handles?